This program is offered in a newer training facility, equipped with state of the art kitchen equipment and tools. The purpose of the program is to train future leaders in the hospitality industry. Extensive experience in catering special public events is available. Students work on the skills necessary to master various food service study areas. The program includes: Food preparation techniques, food presentation and service, kitchen management, menu design/development, and culinary math skills. Students will have the opportunity to receive their Servesafe® Food Protection Manager Certification. National Occupational Competency Testing with Advanced Certification is administered upon completion of the course. 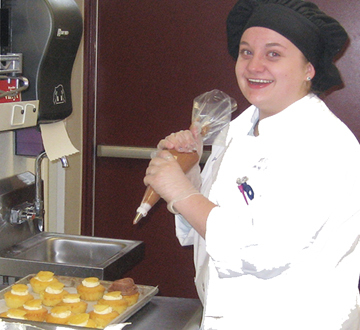 This curriculum is designed to fulfill the increasing employment demands for trained food service professionals. Graduates will be prepared to enter the workforce with a wide range of job experiences attained within all aspects of the modern kitchen including; garde manger, saucier, rotisseur, entremetier and patissier. Successful completion of the program will qualify a graduate to be employed in salad prep, sous chef, braiser, cook, short order cook, management trainee, salad preparation, baking, prep cook, cashier and (with further training) chef and pastry chef and more!! This program utilizes college level curriculum which offers the graduates a post secondary competitive advantage. The students also have the opportunity to visit post secondary schools and have many of those schools visit the class during class time. The course encompasses three levels of skills to be mastered, with more than 200 competencies. The program is designed to allow for co-operative education job placement during the third level. Early college credit is available through Allegany College of Maryland.